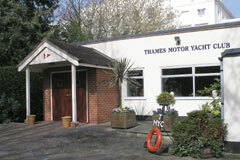 TMYC's headquarters are situated at an idyllic site just above Hampton Court Palace immediately below the weir at Molesey Lock and is fortunate to boast a river frontage of well over 100 metres with permanent moorings for some twenty plus club member vessels. Overlooking the moorings is the Riverside Bar, open on Friday nights and at weekend lunch times, with its large patio and barbecue area ever popular with the members during the warmer summer months. 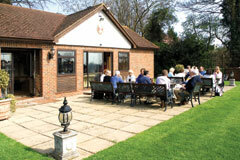 The main Clubhouse has facilities to entertain and feed up to 150 people, has its own large bar and fully fitted galley. Dinner and dances are frequently held there for the benefit of Club members and when the members themselves are not using the Club, it is available for hire for outside functions. Within the Club grounds there is secure car parking facilities for about 30 cars. As well as providing moorings for its own members, visiting members and yachtsmen of other clubs are always welcome to visit at weekends to enjoy the Club's facilities, but please contact us first.